Western blot analysis of extracts from NIH/3T3 cells, untreated (-) or treated with Human Platelet-Derived Growth Factor AA (hPDGF-AA) #8913 (100 ng/ml, 5 min; +), using Phospho-Akt (Thr308) (D25E6) XP® Rabbit mAb (Biotinylated) (upper) or β-Actin (D6A8) Rabbit mAb #8457 (lower). Supplied in 136 mM NaCl, 2.6 mM KCI, 12 mM sodium phosphate (pH 7.4) dibasic, 2 mg/ml BSA, and 50% glycerol. Store at –20°C. Do not aliquot the antibody. 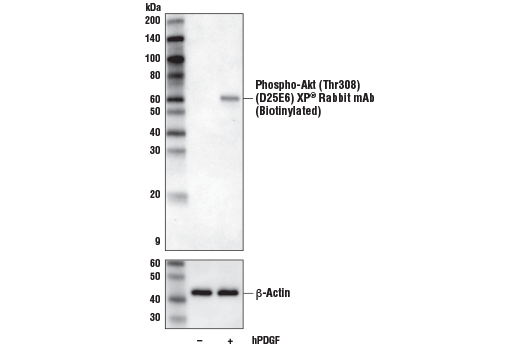 Phospho-Akt (Thr308) (D25E6) XP® Rabbit mAb (Biotinylated) recognizes endogenous levels of Akt1 protein only when phosphorylated at Thr308. This antibody also recognizes endogenous levels of Akt2 protein when phosphorylated at Thr309 or Akt3 protein when phosphorylated at Thr305. Monoclonal antibody is produced by immunizing animals with a synthetic peptide corresponding to residues surrounding Thr308 of human Akt1 protein. This Cell Signaling Technology antibody is conjugated to biotin under optimal conditions. The biotinylated antibody is expected to exhibit the same species cross-reactivity as the unconjugated Phospho-Akt (Thr308) (D25E6) XP® Rabbit mAb #13038.